Sky's getting dark, set up camp for the night. That pretty much summed up the day. It's amazing just how different it is driving in Ethel at this time of year to how it was in January down through Queensland. Being air-cooled, it's not normally a good idea to push a kombi van too hard for too long ... unless you want to kill the engine, that is. We've treated Ethel with care, but now that Australia is in winter time and we're further south, it's easier to get further in a day - Ethel is driving faster and I'm not even remotely concerned that the engine is overheating. In fact, after a 3-hour drive, I can open the engine bay and place my hand right there on the engine and it's not even 'tepid'. Dependable? Reliable? You bet - I'm thinking of getting a sticker for her that reads 'Ethel the Ever-Ready' .. but I don't want to jinx us, so perhaps that's not so wise! So, yesterday's driving took us from Port Fairy, crossing the Victoria/South Australia border and eventually to a place named Meningie, just 150km shy of Adelaide proper. I was pleased to stop for the evening as it had been a difficult day driving. It wasn't the distance that bothered me, and the sky was clear ... but talk about wind! It seems like the whole of southern Australia has been getting strong winds (100km/h winds forecasted for Melbourne this morning), and Ethel, being a relatively high-sided vehicle, felt every single gust. At times I felt I was wrestling with the large steering wheel to keep her going in a straight line, with some gusts forcing us just into the opposite lane. It's a good thing the roads were not that busy. We left Meningie this morning and soon covered the 150km to Adelaide, stopping briefly at Mount Lofty on the way. Mount Lofty is only a 20-minute drive from the city of Adelaide and, at 710 metres above sea level, offers good views over the city, suburbs and out to the coast. At least, it would if it weren't raining over Adelaide. Mount Lofty had escaped that weather but we knew that we would be heading into it very soon. The observation beacon at Mt Lofty. When arriving at a new city - in Australia and New Zealand, at least - our tactic has mostly been to follow the road signs and maps right into the centre, to wherever the shopping centre is. This is not because we have a craving to go shopping, but generally it seems a good way to familiarise ourselves a little with the districts. Looking at a map is useless before visiting a place. Sure you can do research, but you need a context, and driving around the city trying to find a parking space that affords enough head clearance to park a kombi is a good way of learning the streets; quite often, we'll see the same street three times over. Then, looking back at the map it all seems to make a little more sense. This is what happened today - we found the centre of Adelaide and just about found a parking space. It was open-air (good thing for the kombi) but immediately after paying for the ticket Manda pointed out the array of empty bottles of Bundaberg Rum, Johnnie Walker Whiskey and other suitably strong spirits at the side of the car park, then spotted the broken bottles. Was this the place the winos (or 'derros', to use a local term) hung out? It looked like it. Walking down Hindley Street towards the main shopping area of Rundle Street gave us further proof that we were in the less salubrious part of town, as we passed a selection of tattoo parlours, strip clubs and adult 'book' shops. We made a mental note not to park there again if it can be helped. 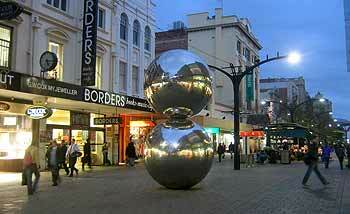 A reflective ... er 'thing' ... in Adelaide's main shopping area of Rundle Street Mall. What was I saying about not shopping? Well, we succumbed ... but mostly for stuff that we need to get (including some overdue birthday presents that I have to mail back to England). Then it was time, once again, to find a caravan park for Ethel for the night. We made our way out of the city to a place called Glenelg, then up the road a couple of kms to a site called Adelaide Shores - possibly the largest and best equipped caravan park we'd been to yet. Don't get too carried away about that last, earth-shatteringly exciting nugget of information, folks. I'm sure I can conjure up more if pushed.